Can I just say, ermahgerd! This Strawberries & Cream Vegan French Toast is EVERYTHING. This dish is my brunch fantasy come to life. I first saw it in the pages of an in-flight magazine a few months ago. Some fancy-schmancy restaurant created the most delectable (non-vegan) french toast I had every seen and I started drooling all over the photo. Drizzled with sweetened condensed milk, then sprinkled with fresh strawberries and Fruity Pebbles, their french toast was a gooey, doughy mess of my favorite childhood breakfast cereal. I just had to make it vegan. Alas, Fruity Pebbles are not vegan (the red food dye is made from crushed beetle shells). So I swapped freeze dried strawberries for the fresh ones. The chewy texture and concentrated flavor make them a lovely substitution for Fruity Pebbles and lend a breakfast cereal vibe to the Strawberries & Cream Vegan French Toast! A generous drizzle of sweetened condensed coconut milk takes this brunch magic over the edge. Oh and did we mention Aquafaba? It’s the liquid from a can of chickpeas and my new best friend in the kitchen! It whipped up deliciously in our Vegan Pink Lemon Meringue Pie and makes a wonderful egg replacer in this Strawberries & Cream Vegan French Toast. What can’t this stuff do? Bonus- it’s something that would normally be discarded so it’s like upcycling food waste! BOOM. UNBELIEVABLE vegan french toast! Doughy, gooey, delicious, and perfect for brunch! Only 9 ingredients and ready in 20 minutes. In a shallow bowl, combine the aquafaba, coconut milk, maple syrup, and vanilla. Whisk until the mixture becomes frothy. Chop the freeze dried strawberries into small pieces. Heat a skillet on medium low with a generous spray of cooking oil. Coat the bread slices in the aquafaba mixture on each side, letting the excess drip from the bread before placing it in the skillet. Cook until golden brown, about 3-4 minutes on each side. To get a nice crust, spray the bread with coconut oil on each side and cook for another minute or so. Drizzle a generous amount of sweetened condensed coconut milk on the french toast and top it off with freeze dried strawberry sprinkles. No joke, this Strawberries & Cream Vegan French Toast is the best french toast I’ve ever had. I may or may not have eaten the leftovers straight from the fridge with my hands. I can’t help myself around french toast! 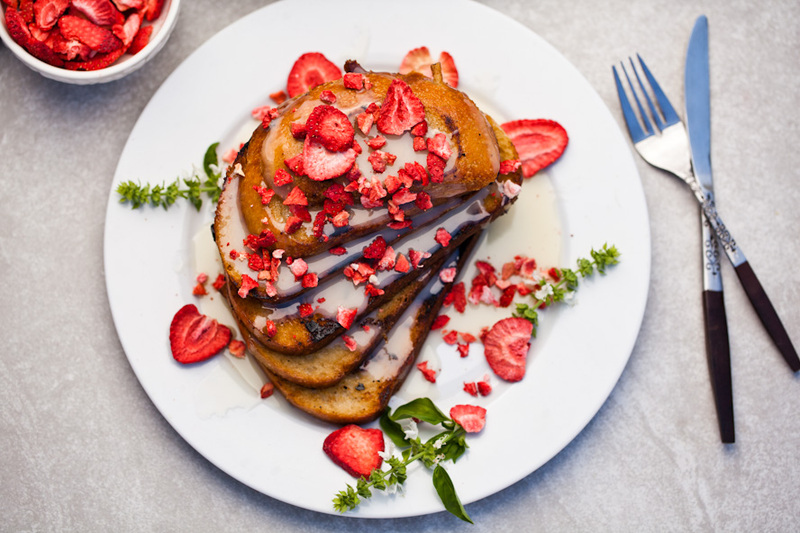 Did you make this Strawberries & Cream Vegan French Toast? Tell us all about it in the comments! While you’re at it, post a photo of your brunch magic to Instagram with the tag #carrotsandflowers 🙂 It will seriously make our day! If you love vegan breakfast food and Strawberries & Cream Vegan French Toast, be sure to check out our Vegan Baked Polenta with Mushrooms and our TO DIE FOR Strawberry Chia Seed Jam.